It’s 2018 and it’s safe to say that selfies are the most popular way of taking a photo. I mean, they are pretty great. You don’t have to rely on someone else taking the photo for you. It takes practice, but people learn to take some PERFECT photos on their own. Think about it, when you ask someone else to take a photo for you, there is a risk of them not taking the best photo. The angle and lighting is EVERYTHING. Nothing can possibly go wrong when you are taking a selfie, right? Well, not exactly. There are people whose selfie went terribly wrong. Terribly and hilariously. Basically, you can say that it went terribly wrong for them and it ended it being pretty hilarious for us. These photos just go to show that you need to check your surroundings prior to taking the photo and check the photo before posting it online! 1. Bugs are often hard to spot. Especially when your back is towards them or they are near the top of your head. These girls spotted this MASSIVE spider hanging out with them while taking their selfie. Who knows, maybe he wanted some camera action as well. 2. If you are tired of seeing the same dad-baby-dog selfie, then look no further. Check out this adorable photo of a father and his baby. Oh, and their dog is “releasing some stress” in the background. 3. People tend to laugh at those girls who take selfies all day every day. I mean, honestly, they can get pretty frustrating. This girl’s dog was definitely tired of her selfies. He decided to spice it up a bit. Good job doggy! 4. Fathers tend to not understand this entire millennial era. Selfies are a big part of it. All the faces people make when taking a selfie, the poses that are done to take the photo, the duck face, etc. Well, this father tried to be hip with his daughter. Epic fail. 5. It’s beginning to look like dogs have a huge role in messing up a cute selfie between two friends. This boy clearly was too camera shy to show his face, so he decided to do the “oops, I turned around at the wrong time” move. Made for a hilarious photo! 6. This sports team decided to take a group photo of what probably is their big win. However, one guy decided to take a shower at the wrong time. But considering this team is all about including everyone, they decided to include him in the photo. Regardless of the timing. 7. People really need to make sure no mirrors are around them while taking a selfie. They reveal all the secrets to people seeing the photo. For example this girl. She took a lovely selfie on the toilet. Bad timing girl. Bad. Timing. 8. Guessing this girl was feeling really good about her outfit that day and decided to take an OOTD (outfit of the day) photo. Everything looks great! Her hair, outfit, tan…but again. Those damn mirrors. Guessing after she saw this photo, she thought: “It’s SNOT funny”. 9. This is the moment when the guy realizes that his girlfriend caught the bouquet. She’s ecstatic, but he looks like he is about to have a panic attack. 10. This guy dressed up for a Ke$ha themed birthday party. While he might have thought his make up was on point, his daughter obviously had her own opinion. 11. This mom is definitely not impressed. Maybe she just thought her daughter would raise above this kind of typical millennial behaviour. Not so much, mom. 12. This is almost a perfect mirror selfie, with almost being the operative word. See, there’s definitely something shady going on, and there’s definitely someone behind that shower curtain. 13. This guy was looking pretty sharp. He was probably getting ready to head out to the prom, but he was so impressed by himself, he didn’t notice how thirsty his cat was. 14. When you’re trying to take a serious, moody selfie, it’s probably better if there isn’t something that’s going to pull attention away from you. Doesn’t anyone know how to crop anymore? 15. There is a certain amount of peril in having two mirrors in your bathroom when taking a selfie. You never know when someone might catch you and use the angles to their advantage. 16. 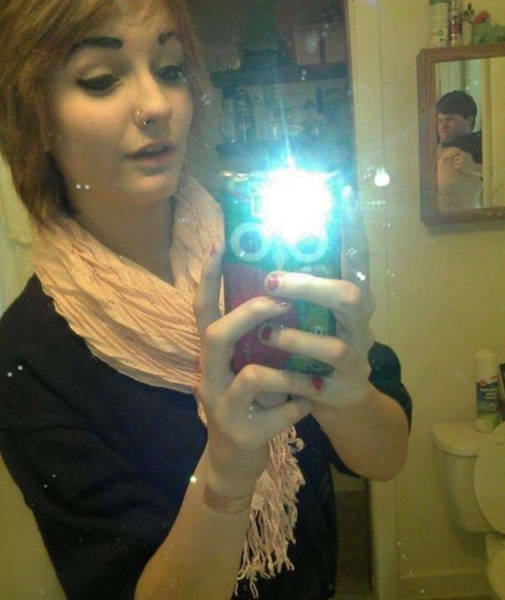 Photobombers are either bad, good, or amazing at their craft. This particular person though is on a completely new level. According to the person who posted this, they didn’t notice anything for six years. 17. What do you do when your selfie contains someone else’s selfie? Do you take a new one? Do you ask to join in on the other person’s? What is the etiquette in this situation? 18. Okay, this seems like your typical selfie. 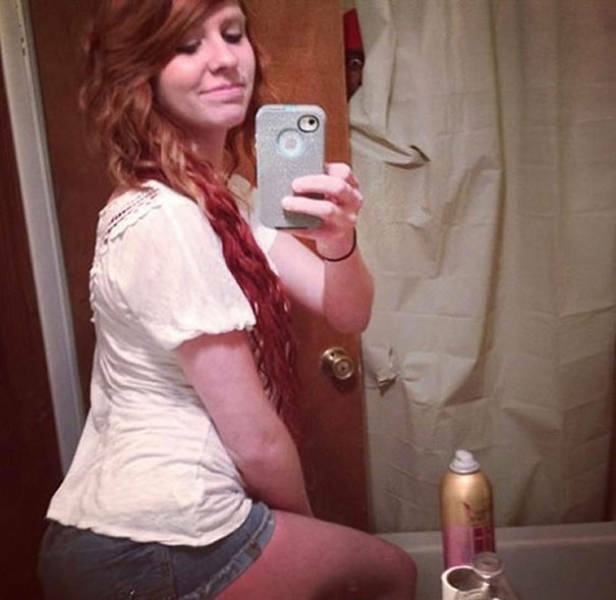 Blurry, bathroom mirror, wait a minute… Something’s not right. Is that a first generation iPhone? Those things were bulky! 19. And they say men can’t multitask. Well, maybe this guy should have just waited to take this selfie, but hey, when you gotta go take a selfie, you gotta go take a selfie. 20. You can almost feel the generational contempt leaking out of this photo. If the older generation didn’t already think millennials are self-absorbed, this would be the perfect piece of evidence. 21. This might be less a case of someone not being aware of the background and more someone who doesn’t really care that their room is an absolute disaster. 22. There’s really a lesson to be learned from all of these selfies, and it’s this: if you’re not checking the background of your selfies before posting, then you’re being a real… Something we can’t think of right now. 23. Hopefully this girl was not only keeping an eye on her selfie but also her ice cream. That dog looks determined to steal it from her. 24. What would you do if you were just taking an innocent selfie at an outdoor festival, and you happened to Catch the dark lord Voldemort in the background? Someone call an auror! 25. Okay, so this one wasn’t meant to be a “selfie,” but while this guy clearly got caught lying about his girlfriend taking his picture, you have to admire his ability to take a selfie with his feet.